I know I should be used to it by now but at this moment, listening to Barack Obama deliver what is a State of the Union Speech in all but name, it's still a shock to hear an articulate, dynamic, positive and progressive Chief Executive address the nation. 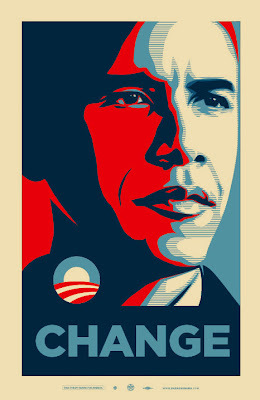 After eight years of Bozo's bumbling, self-justifying, reactionary drivel it's a pleasure to listen to a reasoned and relevant speech addressing and advocating real issues, instead of lies in support of self-serving, disastrous mistakes aimed at creating factionalism, class hatred and cultural warfare. After the long dark years, there is finally--a word I haven't used yet because it has become the great cliche of the Obama phenomenon--there is finally hope. In the last couple of weeks I have finally fully activated a Facebook page I had established some while ago but whose potential for communication and reconnection I hadn't really explored. I am now in contact on a whole new level with colleagues, former students, relatives, many bloggers, and performing artists whose work I have admired. I'm having a lot of fun with it. I've also started a page on Inked-up, a site specifically for gay men and lesbians who are tattooed and/or pierced. I thought the Academy Awards show on Sunday was the best paced and most interesting in many, many years. Having former winners introduce current nominees for the major acting awards honored all of the nominees instead of simply creating one big winner and a bunch of losers. The pathetic, unfunny banter between presenters was gone as were the long, deadly speeches by the president of the Academy and the presenter of the Thalberg Award, that wasn't presented this year. The only part I didn't like was having the camera swoop in frm shallow angles, zoom and pull back constantly during the memorial part of the evening. It made reading the names of some of the deceased very difficult and I found the device itself annoyingly distracting. I thought Hugh Jackman was a delight as host and very easy on the eyes and ears, but the great moments were the acceptance speeches by Dustin Lance Black and Sean Penn for their work on Milk. Fritz, of course was in tears and I have to say I thought they were both incredibly moving, particularly Black (who, it turns out, enjoys going shirtless a lot) in his heartfelt address to gay and lesbian youth. How fortunate I am to have lived so long to see such eloquent openness on American television! Like a breath of fresh air, isn't he? Yes, Lewis, like watching the sky clear after a terrible storm. 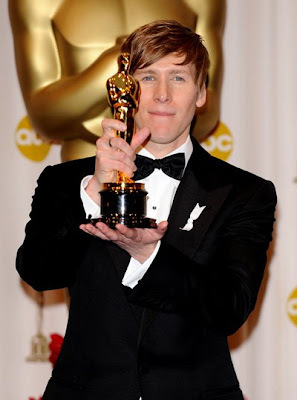 I loved Dustin Lance Black's speech! I got a bit teary eyed. It's on your blog--the comments to your latest post. Perfectly written. I agree with every word you said! He is a beautiful man and actually I love his acceptance speech. Beautiful! Charles, you're a sweetheart--thanks. You, and anybody else who wants to, can go off topic any time you like. It's called conversation! Really, as bad as the economy is, I think there really are signs of good things to come!